Novel siloxane macromonomers are disclosed which can be copolymerized with hydrophilic monomers or hydrophobic monomers to prepare polymeric materials useful as biomedical devices. The copolymers made from hydrophilic monomers exhibit good oxygen permeability and are particularly suitable for use in contact lenses. The present invention relates to novel macromonomers useful in the preparation of biomedical devices. More particularly, this invention relates to siloxane macromonomers which can be copolymerized with hydrophilic or hydrophobic monomers to prepare biomedical devices such as contact lenses. This invention includes the macromonomers, intermediate polymers used to prepare the macromonomers and the copolymers prepared from the macromonomers. Various monomers useful in the preparation of biomedical devices are known. For example, contact lenses, one type of biomedical device, consist of polymers and copolymers having various types and concentrations of monomers. Rigid gas-permeable (RGP) contact lenses generally include silicone-containing monomers which are generally hydrophobic in nature. Soft contact lenses or "hydrogel" lenses are generally made from hydrophilic monomers such as poly-hydroxyethyl methacrylate. Until recent years, RGP contact lenses and hydrogel contact lenses had distinct properties. Hydrogel contact lenses, particularly those with high water content, tended to be weak, subject to deposit formation, and exhibit lower visual acuity than RGP lenses. RGP contact lenses tended to be less comfortable, had low water content, and generally exhibit higher visual acuity than hydrogel or "soft" lenses. RGP lenses often required wetting additives or surface coatings to provide adequate wettability. More recently, the distinction between RGP contact lenses and hydrogel contact lenses has become blurred. For example, hydrophilic monomers have been copolymerized with certain siloxane monomers, such as 3-methacryloxypropyltris (trimethyl siloxy) silane (hereinafter TRIS), and dimers to produce contact lenses. For example, see U.S. patents 4,711,943 and 4,182,822 which discuss such copolymers. New polymeric materials are continually being developed for biomedical devices which exhibit the strength and durability normally found with silicone-containing polymers yet provide the flexibility and water content often found with hydrophilic polymers. In the case of contact lenses, it is desirable to combine the beneficial properties of such polymers to obtain a copolymer having the best possible physical properties for overall lens performance and comfort. Thus, it continues to be desirable to obtain a contact lens having enough resilience in the hydrated state to maintain adequate lens shape. At the same time, the lens should not be so rigid as to cause any physiological problems such as corneal staining or flattening of the cornea, or other discomfort. On the other hand, the lens should not be too soft, or it will be difficult to handle and will tear easily during normal use. Further, if the lens is too soft, it will often result in poor optics. It should also be noted that many additional factors can affect the performance of the copolymer materials. For example, the type and concentration of crosslinkers employed, which generally tie together long polymer chains, can significantly vary the properties of the materials. Further, various modifying agents can be employed to achieve desired physical visco-elastic and/or physiological properties such as strength, modulus, and various surface properties. As described above, the use of TRIS monomers in RGP lenses is well known. TRIS is typically used as a strengthening agent or a modulus modifier and aids to increase oxygen permeability. Generally, TRIS lowers the modulus of the final copolymer. However, the present macromonomer can be advantageously employed to increase the silicone content of the copolymer and thereby increase the oxygen permeability without affecting the modulus of the copolymer to the extent experienced with TRIS. In fact, the present siloxane macromonomer can be employed in hydrogel copolymers in amounts of up to about 90 percent by weight of the final copolymer and still exhibit typical hydrogel characteristics. The present invention is directed to novel siloxane macromonomers which can be copolymerized with hydrophilic monomers to prepare novel polymeric materials useful as biomedical devices and particularly useful as contact lens materials. Further, these macromonomers can be randomly copolymerized to produce elastomers having high oxygen permeability. Even further, these macromonomers can be randomly copolymerized with other classes of monomers, including those typically used as crosslinking agents and strengthening agents, to prepare polymeric materials which are strong, durable, and have high oxygen permeability. and m is an integer from 2 to 120, preferably from 2 to 25. Also provided by the present invention are copolymers prepared using the siloxane macromonomer of. formula I above, and intermediate polymers used to prepare the siloxane macromonomer. The copolymers are useful in biomedical devices such as intraocular lenses, heart valves and other prostheses. The siloxane macromonomer of the present invention is suitable as a component of biomedical devices and, particularly, in contact lenses since they provide good oxygen permeability, stability, and durability. 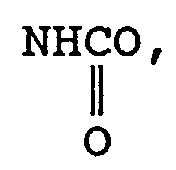 wherein A is O or NH, R1 is H or CH3, and each R2 is independently selected from a C2 to C4 alkyl group and a [(CH3)3 SiO] group and n is an integer from 2 to 4. The present macromonomers are prepared by the polymerization of the parent siloxane monomer (precursor of formula II) in the presence of a functional chain transfer agent (precursor of E) to obtain an intermediate polymer. Illustrative examples of suitable parent siloxane monomers include TRIS, N-[tris(trimethyl siloxy)silylpropyl] methacrylamide (TSMAA), N-(tris(trimethylsiloxy)silylpropyl] acrylamide(TSAA) N-[tris(trimethylsiloxy)silylpropyl] methacryloxyethylcarbonate (TSMC), N-[tris(dimethylpropylsiloxy)silylpropyl]methacrylamide, N-[tris(dimethylphenylsiloxy)silylpropyl]methacrylamide, N-[tris(trimethylsiloxy)silylpropyl]methacryloxyglyceryl carbamate, N-[tris(dimethylethylsiloxy)silylpropyl methacrylamide, N-[tris(trimethylsiloxy)silylpropyl methacryloxyacetamide, N-[tris(trimethylsiloxy)silypropyl] methacryloxymethyl, dimethylacetamide, pentamethyldisiloxanymethyl methacrylate or acrylate, triphenyldemethyldisiloxyanylmethyl methacrylate or acrylate, and 3[tris(trimethylsilyloxy)silyl]propyl vinyl carbonate and carbamate (collectively TRISVC). Preferred parent siloxane monomers include TRIS, TSMAA, TSAA, TSMC and TRISVC. The functional chain transfer agent controls the molecular weight and provides appropriate functionality for subsequent addition at the end of the intermediate polymer. Illustrative examples of suitable functional chain transfer agents include mercapto carboxylic acids, mercapto alcohols (also known as hydroxy mercaptans), and aminomercaptans with mercapto carboxylic acids and mercapto alcohols being preferred. Specific examples of suitable functional chain transfer agents include thioglycolic acid, 2-mercaptoethanol and 2-aminoethane thiol. The molar ratio of chain transfer agent to total parent siloxane monomer is suitably from 0.01 to 0.5, preferably from 0.05 to 0.4 and most preferably from 0.06 to 0.3. However, other reactive groups other than those specifically described above can be employed as are known to those skilled in the art. Illustrative examples of suitable compounds include, but are not limited to 2-isocyanatoethyl methacrylate and glycidyl (meth)acrylate. 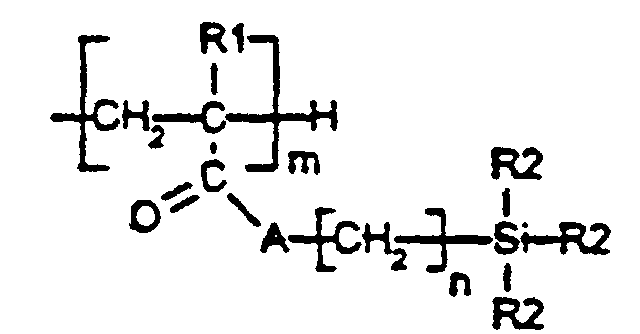 The general reaction scheme for preparing the macromonomers of the present invention are generally known and are discussed in the article titled Synthesis of Methyl Methacrylate - Stearyl Methacrylate Graph Copolymers and Characterization By Inverse Gas Chromatography, K. Ito, et al, Macromolecules 1980, 216-221 which is incorporated herein by reference. In a preferred embodiment, the siloxane monomer 3-methacryloyloxypropyltris (trimethy siloxy) silane (TRIS) is polymerized in the presence of thioglycolic acid or mercapto ethanol as the functional chain transfer agent. TRIS, the functional chain transfer agent, and a suitable polymerization initiator such as azoisobutyronitrile are mixed. The mixture is deoxygenated, such as by vacuum or under an inert gas, and then heated and maintained at elevated temperatures, typically from 40°C to 70°C for 10 to 100 hours under an inert gas blanket. The intermediate polymer is mixed with a suitable compound having at least one ethylenically unsaturated group such as 2-isocyanatoethyl methacrylate. The mixture is refluxed under an inert gas until the reaction is complete. The solvent is removed by evaporation, vacuum or both and the resulting macromonomers are collected and purified such as by washing, as desired. The macromonomers of the present invention may be copolymerized with various monomers to give suitable biomedical materials. Biomedical materials generally have physiochemical properties which render them suitable for prolonged contact with living tissues, blood, and membranes without adverse reaction. In the case of contact lens materials, the present macromonomers can be copolymerized with either hydrophilic monomers or hydrophobic monomers. As discussed above, the present siloxane macromonomers can be copolymerized with one or more hydrophilic monomers to prepare biomedical devices such as hydrogel contact lenses. As used herein, hydrogel refers to a hydrated crosslinked polymeric system that contains water at an equilibrium state. The macromonomer containing hydrogels are prepared by randomly copolymerizing a mixture containing at least one siloxane macromonomer of the present invention and at least one hydrophilic monomer. Although the hydrophilic monomer can function as a crosslinking agent (being defined as a monomer having multiple polymerizable functionalities), a separate crosslinker is preferably employed. Further, strengthening agents can be employed to give the desired physical properties such as 4-t-butyl-2-hydroxycyclohexyl methacrylate (TBCM), cyclohexyl methacrylate, TRIS and isobornyl (meth) acrylate. Further, dyes, UV blockers, blue blockers and the like can be incorporated into the copolymer. Preferred hydrophilic monomers may be either vinyl- or acrylic-containing. The term "vinyl-containing" monomers refers to monomers containing the vinyl grouping(CH2=CH-) and are generally highly reactive. Such hydrophilic vinyl-containing monomers are known to polymerize relatively easily. Preferred hydrophilic vinyl-containing monomers which may be incorporated into the hydrogels of the present invention include monomers such as N-vinyl lactams (e.g. N-vinyl pyrrolidone (NVP)), N-vinyl-N-methyl acetamide, N-vinyl-N-ethyl acetamide, N-vinyl-N-ethyl formamide and N-vinyl formamide, with NVP being the most preferred. "Acrylic-type" or "acrylic-containing" monomers are those monomers containing an acrylic group which are also known to polymerize readily. Preferred hydrophilic acrylic-containing monomers which may be incorporated into the hydrogel.of the present invention include hydrophilic monomers such as N,N-dimethyl acrylamide (DMA), 2-hydroxyethyl methacrylate, glycerol methacrylate, 2-hydroxyethyl methacrylamide, methacrylic acid and acrylic acid, with DMA being most preferred. When both an acrylic-containing monomer and a vinyl-containing monomer are incorporated into the polymer network, a further crosslinking agent having both a vinyl and an acrylic polymerizable group may be used, such as allyl methacrylates and the crosslinkers which are in part the subject of presently co-pending European Patent Application No 92924307 - Publication No. 0611367. Such crosslinkers help to render the resulting copolymer totally UV-curable. However, the copolymer could also be cured solely by heating, or with a combined UV and heat regimen. As known to the skilled artisan, suitable photo and/or thermal initiators are required to cure the copolymer and shall be included in the monomer mix. Suitable crosslinking agents which may be incorporated into the siloxane macromonomer-containing copolymer of the present invention include polyvinyl, typically di- or trivinyl monomers, most commonly the di- or tri(meth)acrylates of dihydric ethylene glycol, triethylene glycol, butylene glycol, hexane-1,6-diol, thio-diethylene glycol-diacrylate and methacrylate; neopentyl glycol diacrylate; trimethylolpropane triacrylate N,N'-dihydroxyethylene-bisacrylamide and -bismethacrylamides; diallyl compounds like diallyl phthalate and triallyl cyanurate; divinylbenzene; ethylene glycol divinyl ether; and (meth)acrylate esters of polyols such as triethanolamine, glycerol, pentaerythritol, butylene glycol, mannitol, and sorbitol. Further, illustrative examples include N,N-methylene-bis-(meth)acrylamide, sulfonated divinylbenzene, and divinylsulfone. Also useful are the reaction products of hydroxyalkyl (meth)acrylates with unsaturated isocyanates, for example the reaction product of 2-hydroxyethyl methacrylate with 2-isocyanatoethyl methacrylate (IEM) as disclosed in U.S. Patent No. 4,954,587 and dimers of TRIS as disclosed in U.S. Patent 4,711,943. Additional crosslinking agents include polyether-bisurethane-dimethacrylates as described in U.S. Patent No. 4,192,827, and those crosslinkers obtained by reaction of polyethylene glycol, polypropylene glycol and polytetramethylene glycol with 2-isocyanatoethyl methacrylate (IEM) or m-isopropenyl-, dimethylbenzyl isocyanates (m-TMI), and polysiloxane-bisurethane-dimethacrylates as described in U.S. Patent Nos. 4,486,577 and 4,605,712. Illustrative examples of preferred crosslinking agents of this type include polyethylene glycol dimethacrylate (PEGDMA) and polypropylene glycol dimethacrylate (PPGDMA). Still other known crosslinking agents are the reaction products of polyvinyl alcohol, ethoxylated polyvinyl alcohol or of polyvinyl alcohol-co-ethylene with 0.1 to 10 mol percent vinyl isocyanates like IEM or m-TMI. As apparent to those skilled in the art, many monomers can function as crosslinking agents or can be used as monomers in the copolymerization. 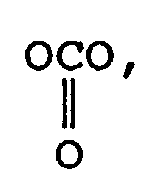 For example, one preferred class of silicone-containing monomers which can function as either crosslinking agents or as comonomers as described below is a poly(organosiloxane) polymer as described in U.S. patent 4,153,641.
wherein x is an integer from between 15 and 300. As referred to herein, these compounds are known as M2Dx wherein M represents the structural formula VI shown above, D represents the -(CH3)2 SiO- group and x is an integer representing the number of repeating units of D.
The most preferred crosslinking agents for the hydrogel materials are selected from PEGDMA, PPGDMA, polyorganosiloxane monomers and dimers of TRIS. Varying the ratio of hydrophilic monomer to siloxane macromonomer will change the properties of the final polymeric material. Accordingly, the selection of a particular ratio will be governed by the particular properties ultimately sought from the polymeric material. Typically, the siloxane macromonomer is present in the hydrogel copolymers in amounts from 1 to 90 weight percent, preferably will range from 10 to 80 weight percent, and most preferably from 20 to 70 weight percent. Further, the crosslinking agent may be optionally present in amounts up to 80 percent, preferably up to 60 percent by weight of the final copolymer. The random hydrogel copolymers of the present invention are prepared by known polymerization processes such as by free radical mechanisms using a wide variety of known free radical polymerization catalysts or initiators such as diacyl peroxides, such as benzoyl peroxide; dialkyl peroxides, such as di-tert-butyl peroxides; ketone peroxides; methylethyl ketone peroxides; and peresters which readily hydrolyze such as tert-butyl peracetate, tert-butyl perbenzoate, di-tert-butyl diperphthalate. A particular useful class of peroxy initiators are the organic hydroperoxides such as cumene hydroperoxide, methyl ethyl ketone hydroperoxide, tert-butyl hydroperoxide, and the like. The initiator generally should be used as a concentration from 0.01 to 10 percent by weight of the total formulation, preferably 0.1 to 5 percent by weight. Yet another class of initiators include carbonyl-containing ultraviolet-activated free radical generators, such as acetophenone, benzophenone, and benzoin ethers. Other suitable UV initiators and initiator mixtures will be apparent to the skilled artisan. Copolymerization of hydrogel materials is generally performed in the presence of a solvent. Solvent choices will depend on the solubility perimeters of the macromonomers and monomers used and should be chosen to allow full solubilization of all components. Preferred solvents include, but are not limited to, tetrahydrofuran, dioxane, chloroform, dichloromethane, aliphatic alcohols, and mixtures thereof. The solvent, if nonaqueous, should be removed and replaced with water through the use of extraction and hydration procedures well known in the art. As mentioned above, the present siloxane macromonomers can be copolymerized with the monomers described above as crosslinkers and strengthening agents or other hydrophobic monomers to prepare novel elastomers. As used herein, the term elastomers refers to copolymers which do not contain hydrophilic monomers. Examples of preferred hydrophobic monomers which can be copolymerized with the present siloxane macromonomer include the silicone-containing monomers as described above, polyethylene glycol di(meth)acrylate and polypropylene glycol di(meth)acrylate. Most preferred are the poly(organosiloxane) described above by formula VI which can be used to prepare novel elastomers useful in the preparation of biomedical devices. These elastomers are prepared by the general copolymerization processes discussed above for the hydrogel copolymers except that the hydrophilic monomers are replaced with the hydrophobic or other monomers and the use of solvents may not be necessary. Such copolymerization can be conducted by those skilled in the art without undue experimentation. Generally, the siloxane macromonomer is present in the elastomer in amounts from 1 to 90, preferably from 10 to 80 and most preferably from 20 to 70 weight percent. Moreover, crosslinking agents can be employed in amounts of up to 80 percent, preferably up to 70 percent, by weight of the final copolymer. The hydrogel or elastomer copolymers of this invention can be casted into films or biomedical devices by spincasting processes, cast molding processes, and other known processes. Once formed, the devices can be further processed, as needed, using known techniques. TRIS (100 g, 0.24 moles), thioglycolic acid (6.64 g, 0.072 moles) and azoisobutyronitrile (0.40 g, 2.4 m mole) were combined in a 250 mL round bottom flask. The mixture was deoxygenated by nitrogen bubbling for about 10 minutes. The mixture was then heated to 60°C for 16 hours under a nitrogen blanket. The polymer was then dissolved in diethyl ether and washed three times in deionized water. The organic layer was then dried over magnesium sulfate. The magnesium sulfate was removed by filtration and the resulting polymer was isolated by flash evaporation of the solvent. The number average molecular weight of the resulting polymer was 1471 by size exclusion chromatography (sec) (vs. polystyrene standards) and the polydispersity, Mw/Mn, was 1.4. The number average molecular weight as determined by end group titration was 1218. These polymers were used to prepare the macromonomer below. The functionalized intermediate polymer of above (47.2 g, 0.039 moles), glycidyl methacrylate (5.82 g, 0.041 moles), butylated hydroxy toluene (0.005 g) and one drop of N,N-dimethyldodecylamine were combined in 200 mL of anhydrous toluene. The solution was allowed to reflux under a nitrogen blanket for 5 hours. Toluene was then removed by flash evaporation. The sample was then placed under high vacuum (0.25 mm Hg) for 24 hours. The macromonomer had a number average molecular weight of 2500 (vs. polystyrene standards) and a polydispersity of 2.3. TRIS (100g, 0.24 moles), 2-mercaptoethanol (5.63g, .072 moles) and azoisobutyronitrile (0.40g, 2.4m mole) were combined in a 250mL round bottom flask. The mixture was deoxygenated by nitrogen bubbling for about 10 minutes. The mixture was then heated to 60°C for 72 hours under a nitrogen blanket. Completion of the reaction was verified by the disappearance of the C=C stretch using fourier transform infrared techniques. The polymer was then dissolved in diethyl ether and washed three times with deionized water. The organic layers were combined and dried over magnesium sulfate. The magnesium sulfate was removed by filtration and the polymer was isolated after flash evaporation of the solvent. The number average molecular weight, (Mn), of the resulting polymer was 2543 by size exclusion chromatography (sec) (vs. polystyrene standards) and the polydispersity, Mw/Mn, was 1.25. The functionalized intermediate polymer of above (75.0g, 0.029 moles), isocyanatoethyl methacrylate(IEM) (4.68g, .030 moles), dibutyltin dilaurate (2.4g, 3.8m moles) and butylated hydroxy toluene (BHT) (0.02g) were combined in 100mL of absolute chloroform. The solution was allowed to reflux under a nitrogen blanket for 5 hours. Several mls of methanol were then added to destroy any traces of unreacted isocacyanate. The reaction mixture was washed three times with deionized water and the chloroform layer was then dried over magnesium sulfate. The magnesium sulfate was removed by filtration and the macromonomer was isolated after flash evaporation of the solvent. The number average molecular weight (Mn), weight average molecular weight (Mw), and polydispersity (Mw/Mn) of the macromonomer were determined by sec vs. polystyrene standards, (Mn=2257, Mw=3109 and Mw/Mn=1.38). Examples 1-10 were prepared using the macromonomer described in Example A except mercapto ethanol was used in place of the thioglycolic acid as the functional chain transfer agent. Examples 11-13 were prepared using the macromonomer of Example B except Darocur® 1173 (0.2 parts) commercially available from E.M. Industries from Hawthorne, New York, was used as the catalyst. Films were prepared by casting monomer formulations from the Examples above between (silane treated) glass plates. Curing was accomplished by exposure to ultraviolet light (3000-3500 µW/cm2). The copolymer films of Examples 1-10 are hydrogel copolymers of the inventive macromonomer and N,N-dimethylacrylamide (DMA). The catalyst used to make the films in Examples 1-10 was benzoin methyl ether (BME). Hexanol was the solvent at 40 parts. Crosslinking agents used to form gel networks included polyethyleneglycol dimethacrylate (average chain molecular weight of 1000 shown as 1K), polypropyleneglycol dimethacrylate (average chain molecular weight of 4000 shown as 4K), and (α,ω-bis(4-methacryloxybutyl) polydimethylsiloxanes; M2D50, M2D100 and M2D300. The copolymer films of Examples 11-13 are elastomers of the inventive macromonomer and various hydrophobic monomers. The catalyst used to make the films in Examples 11-13 was Darocur® 1173 (0.2 parts). The films were cast neat (no solvent). Each of the films prepared from Examples 1-13 were tested for their physical properties using standard techniques. **The crosslinkers in Examples 11 - 13 are used as comonomers. m is an integer from 2 to 120. The macromonomer of Claim 1 wherein R2 is independently selected from a C2-C4 alkyl group and a (CH3)3 SiO- group. The macromonomer of Claim 2, wherein each R2 is a (CH3)3 SiO- group. The macromonomer of any preceding claim, wherein m is 2 to 25. The macromonomer of any preceding claim wherein E is derived from a compound selected from mercapto carboxylic acids, mercapto alcohols and aminomercaptans. The macromonomer of Claim 5, wherein E is selected from mercapto carboxylic acids and mercapto alcohols. and wherein the precursor to T is selected from the group 3-methacryloxypropyltris (trimethyl siloxy) silane, N-[tris(trimethylsiloxy)silylpropyl]methacryloxyethyl carbonate and 3[tris(trimethylsilyloxy)silyl]propyl vinyl carbonate. The macromonomer of Claim 8, wherein the precursor to T is 3-methacryloxypropyltris (trimethyl siloxy) silane. and wherein the precursor to T is selected from the group N[tris(trimethyl siloxy)siloylpropyl] methacrylamide, N-[tris(Trimethylsiloxy)silylpropyl] acrylamide, and 3[tris(trimethylsilyloxy)silyl]propyl vinyl carbamate. The macromonomer of Claim 10, wherein the precursor to T is N-[tris(trimethylsiloxy)silylpropyl]-acrylamide. wherein E and (T)m are as defined in any preceding claim. The polymer of Claim 12 which is the reaction product of the polymerization of a chain transfer agent selected from mercapto carboxylic acids, mercapto alcohols and aminomercaptans with a siloxane monomer selected from 3-methacryloxypropyltris (trimethyl siloxy) silane, N-[tris(trimethylsiloxy)silylpropyl]methacryloxy-ethyl carbonate and 3[tris(trimethylsilyloxy)silyl]propyl vinyl carbonate. 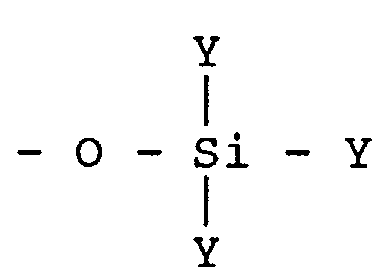 The polymer of Claim 12, wherein the siloxane monomer is a 3-methacryloxypropyltris (trimethyl siloxy) silane. The polymer of Claim 12 which is the reaction product of the polymerization of a chain transfer agent selected from mercapto carboxylic acids, mercapto alcohols and aminomercaptans with a siloxane monomer selected from the group N[tris(trimethyl siloxy)silyl-propyl]methacrylamide, N-[tris(trimethylsiloxy)silylpropyl]acrylamide, and 3[tris(trimethylsilyloxy)silyl]propyl vinyl carbamate. 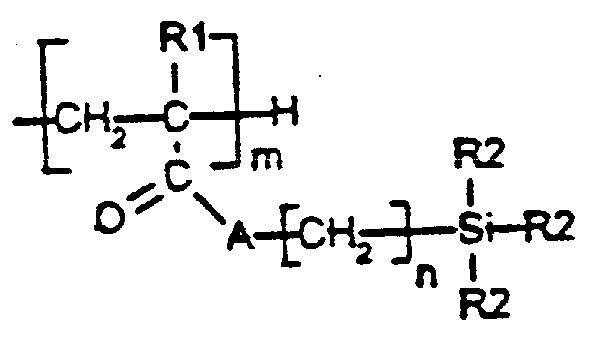 A copolymeric material comprising the reaction product of the polymerization of a hydrophilic monomer, and a siloxane macromonomer as defined in any one of Claims 1-11. The copolymeric material of Claim 16, wherein the siloxane macromonomer is present in amounts from 1 to 90 weight percent of the final copolymer and the copolymeric material is polymerized in the presence of a crosslinking agent present in an amount of up to 80 percent by weight of the final copolymer. The copolymeric material of Claim 17, wherein the siloxane macromonomer is present in amounts from 20 to 70 weight percent of the final copolymer. The copolymeric material of Claim 17 or Claim 18, wherein the crosslinking agent is present in amounts of up to 60 percent by weight of the final copolymer. The copolymeric material of any one of Claims 16-19, wherein the hydrophilic monomer is a vinyl-containing monomer of an acrylic-containing monomer. The copolymeric material of Claim 20, wherein the hydrophilic monomer is selected from N,N-dimethyl acrylamide, 2-hydroxyethyl methacrylate, glycerol methacrylate, 2-hydroxyethyl methacrylamide, methacrylic acid, acrylic acid, N-vinyl lactams, N-vinyl-N-methyl acetamide, N-vinyl-N- ethyl acetamide, N-vinyl-N-ethyl formamide and N-vinyl formamide. A biomedical device made from copolymeric material as defined in any one of Claims 16-21. A contact lens comprised of a copolymer which is the reaction product of the polymerization of a hydrophilic monomer, a crosslinking agent and a siloxane macromonomer as defined in any one of Claims 1-11. The contact lens of Claim 23, wherein said copolymer is as defined in any one of Claims 17-21. The contact lens of Claims 23 or Claim 24, wherein the siloxane macromonomer comprises the reaction product either: (i) of an intermediate polymer formed by polymerizing 3-methacryloyloxypropyl tris(trimethyl siloxy) silane in the presence of thioglycolic acid and glycidyl methacrylate; or (ii) of an intermediate polymer formed by polymerizing 3-methacryloyloxypropyl tris(trimethyl siloxy) silane in the presence of 2-mercaptoethanol and 2-isocyanatoethyl methacrylate. A copolymeric material comprising the reaction product of the polymerization of a hydrophobic monomer and a siloxane macromonomer as defined in any one of Claims 1-11. The copolymeric material of Claim 26, wherein the siloxane macromonomer is present in amounts from 1 to 90 weight percent of the final copolymer and the copolymeric material is polymerized in the presence of a crosslinking agent present in an amount of up to 80 percent by weight of the final copolymer. The copolymeric material of Claim 27, wherein the siloxane macromonomer is present in amounts from 20 to 80 weight percent of the final copolymer. The copolymeric material of any one of Claims 26-28, wherein the hydrophobic monomer is selected from silicone-containing monomers, polyethylene glycol di(meth)acrylate and polypropylene glycol di(meth)acrylate. and wherein x is an integer from 15 to 300.